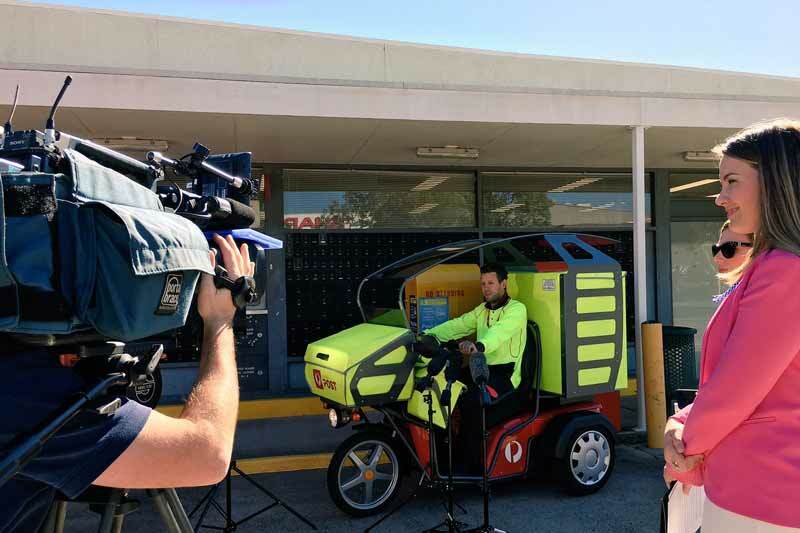 Brisbane postmen are set to pilot a new three-wheel electric delivery vehicle that will allow them to deliver more small parcels than ever before. From this week the new e-vehicle will service Coorparoo, Woolloongabba and East Brisbane over an eight week period. The new e-vehicle has three times the parcel carrying capacity of the current postman motorbike and can hold up to 100 small parcels and 1,200 letters at a time. Queensland State Manager Angela Creedon said Brisbane is a perfect city for the next phase of the electric delivery vehicle rollout with locals increasingly embracing online shopping, and more small parcels being delivered than ever before. "We know that residents in Brisbane love online shopping. In fact the yearly growth rate in the area is over eight per cent," Ms. Creedon said. "Fashion, books, health and beauty products and recreational goods are the most popular purchases among local residents. Our parcels business generates over 70% of our total revenue. Ten years ago parcels contributed less than 25 per cent of our revenue. "While letter volumes have nearly halved, this is another example of how Australia Post is looking at ways to keep our postmen delivering for Australians." The pilot comes off the back of Australia Post announcing a AU$197 million before-tax half-year profit, driven largely by a 5.7% volume growth in the parcels business and postal losses reduced to breakeven. The e-vehicles are already successfully used in Germany and Switzerland, with international postal authorities seeing benefits including greater carrying capacity, improved rider safety and lower vehicle emissions. In Singapore, a similar trial was launched by Singapore Post and TUMCREATE in March 2017 and a manufacturing partner is being sought to convert the electric three-wheeler prototype into a market-ready product.